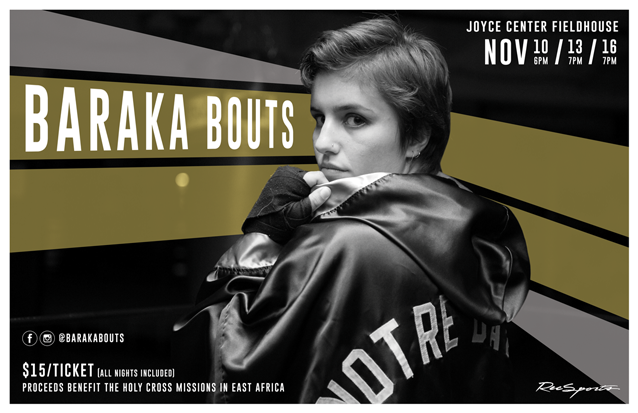 As a member of the Notre Dame Women's Boxing Club, I was part of a fierce team that trained for an annual tournament and raised money for the Holy Cross Missions in East Africa. My skills as a designer gave me the opportunity to further support this club during my senior year. 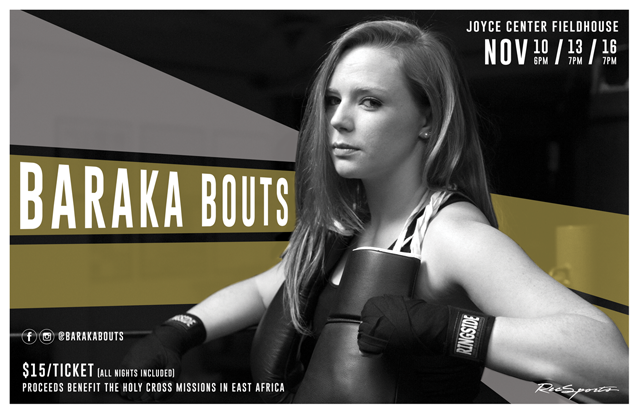 In the fall, my efforts were focused on creating posters for the annual Baraka Bouts tournament. In the spring, I both planned and executed a social media campaign for the team and assisted our brother club with posters for the annual Bengal Bouts tournament. 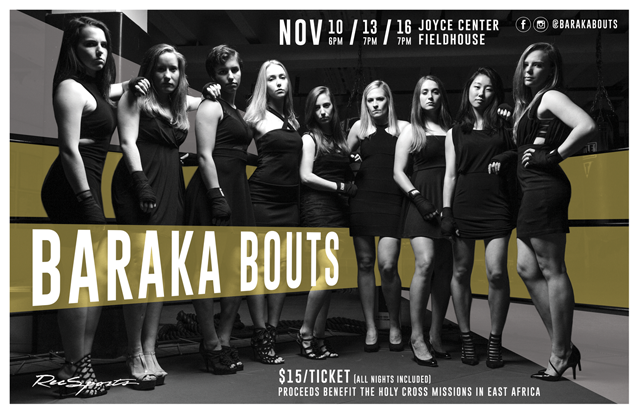 Every year, the captains of the Notre Dame Women's Boxing Club are featured on posters for the annual Baraka Bouts. I began by working on the group poster and was quickly drawn to the lines created by the ropes of the boxing ring. Using these lines as guides, I layered gold and white bars onto the posters to add a sense of dimensionality and additional space for information. 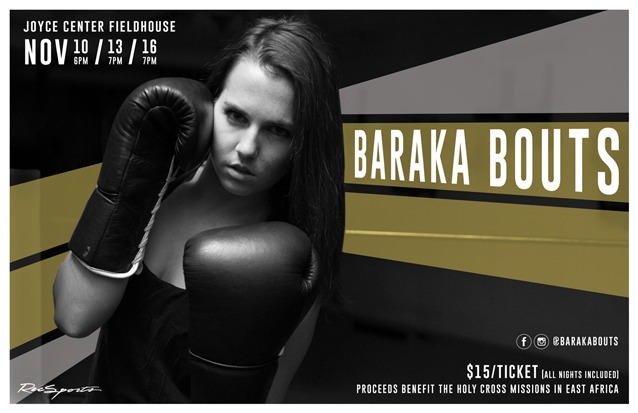 I completed a total of ten Baraka Bouts posters – one group poster and nine individuals, one for each captain. The gold and white bars were tailored to each individual photograph. The posters measured 17x11 inches each. 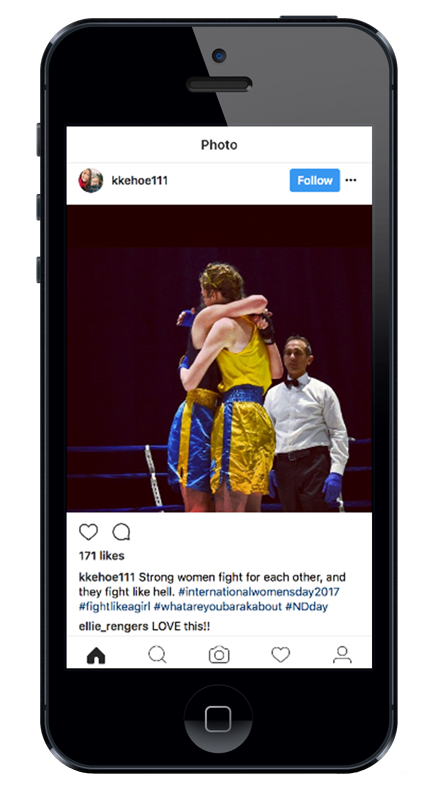 Notre Dame Day social media campaign. Notre Dame Day, or simply ND Day, is a campus-wide fundraiser at the University of Notre Dame. My Social Media class gave me the opportunity to not only go behind the scenes of ND Day but also to plan and execute a social media campaign for the club of my choice. 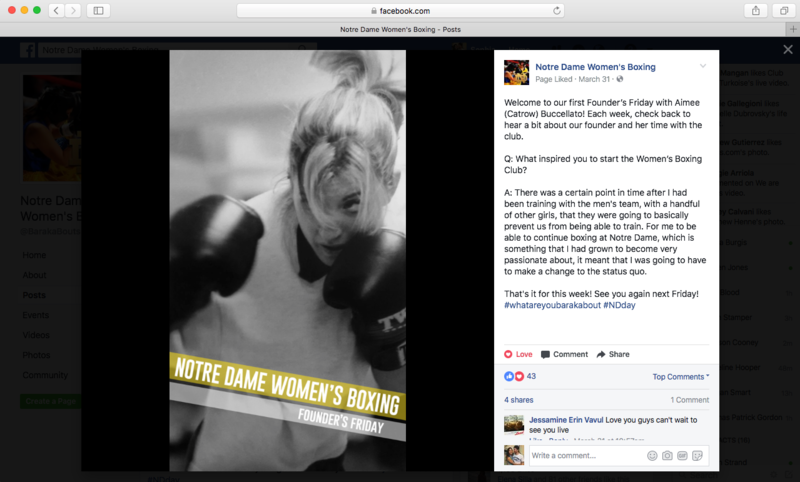 It was an easy for my partner and I to select the Notre Dame Women's Boxing Club. We created a social media campaign that consisted of three key elements: Facebook videos that introduced and explained our goals, tandem Facebook and Instagram posts with words of wisdom from the Club's founder and an Instagram campaign emphasizing our hashtag, #whatareyoubarakabout. I took the lead on content creation and began with the Facebook video series. I used footage from my interviews with six boxers to produce four videos, each with a unique informational purpose. I also made GIFs to accompany Facebook and Instagram posts released on ND Day. My second project was the “Founder's Friday” series. I interviewed Aimee Buccellato, the Club's founder, and asked questions such as what inspired her to start the club and how it has affected her life beyond college. I used the transcripts from this interview to create a series of four posts that were released on Facebook and Instagram on the four Fridays leading up to ND Day. The third and final element of this social media campaign was an Instagram series using the #whatareyoubarakabout hashtag. 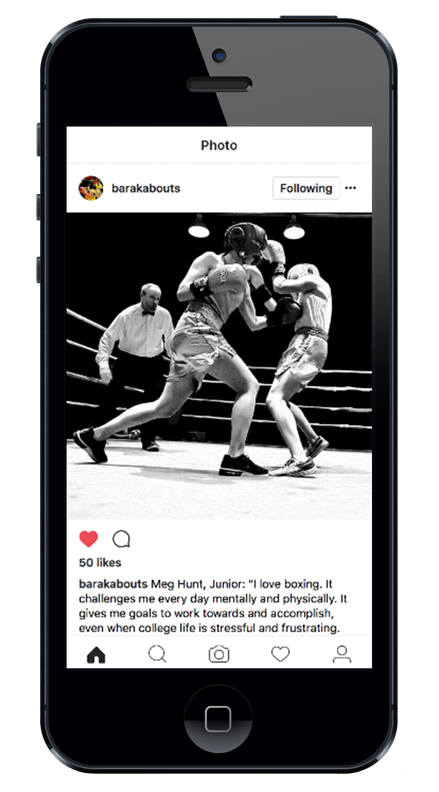 We featured six boxers and their answers to the question, “what are you baraka ‘bout? We encouraged the rest of the team to get involved by posting their own #whatareyoubarakabout Instagrams which we shared on ND Day. 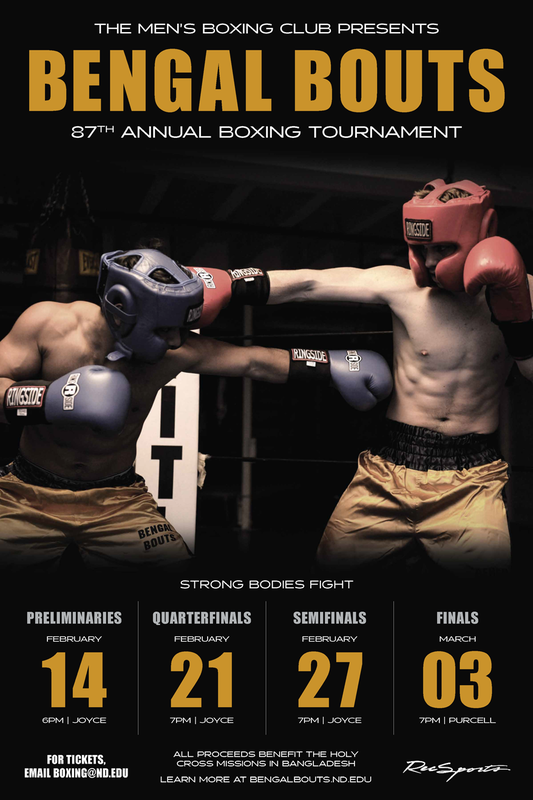 The Notre Dame Men's Boxing Club asked me to design their tournament posters in the spring. The men's captains wanted their posters to be reminiscent of classic fight night posters and invited me to the photoshoot to direct some of the shots. 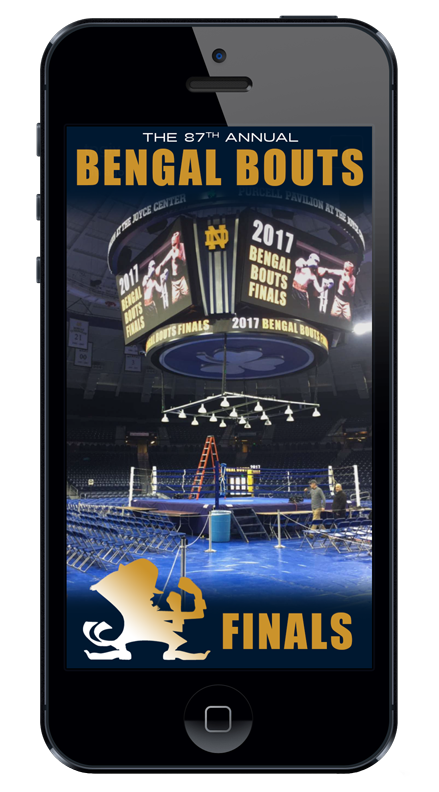 I also created a SnapChat filter for the last night of their Bengal Bouts tournament that was available for use on Notre Dame's campus.